The Grapevine > Articles > AVRL News: Book Bikes are Here and Ready to Roll! Our new Book Bikes, Edgar Allan Go, Chain Austen, JK Rolling, Doretta Groenenbike, Mark Spokely, and friends, are ready to roll. 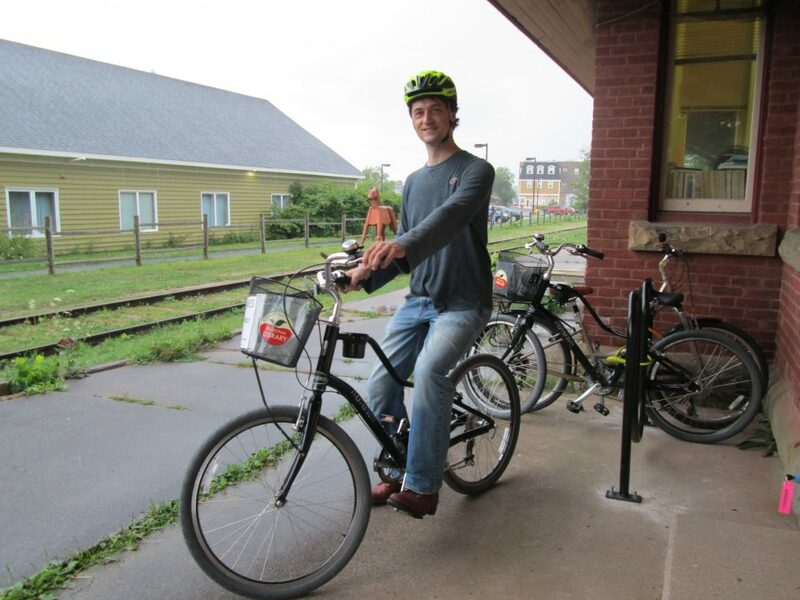 You can borrow a bike from our Berwick or Wolfville branches (coming later this year to Annapolis Royal). Bikes are available on a first-come first-served basis, and are due back the same day, no later than 30 minutes before the library closes. Borrow it for the day or for a couple of hours. Ride the trails or use the bike to get your shopping done around town. Borrow your books and ride them home in the bike basket. Get rolling and moving with a Book Bike! Bikes can be loaned to adults, ages 19 and over, who have a valid AVRL library card in good standing. All riders must read and sign our Book Bike Borrowing Agreement and Waiver. Bikes are loaned with a lock, light, and helmet (a borrower may bring their own helmet). Bikes are equipped with a bell & basket. The bikes will be available for loan from April to October. The project is designed to promote alternate methods of transportation, to highlight the Valley’s Harvest Moon Trailway, and to get people moving. By providing free access to recreational bicycles to those who may not own a bike, or who just need a bike for the day, or who want to explore the area by bike, this project strives to promote cycling, help borrowers develop skills, and become more familiar with cycling in their community. Book Bikes is a project that the Annapolis Valley Regional Library has been working on in partnership with Anna Sherwood, Regional Physical Activity Consultant from the Department of Community Culture & Heritage (Community, Sport & Recreation Division), and the municipalities of Annapolis Royal, Berwick, and Wolfville. Funding for this project comes from a Community Development Grant from the Department of Communities, Culture and Heritage, Community Sport & Recreation Division, a generous private donation, and ongoing donations from local cycling enthusiasts.